Emergency lighting test & servicing by fire industry-approved engineers across London and the South-East. We guarantee to leave you fire-safety compliant. You may be wondering if you need an emergency lighting test or service. Well, UK fire safety legislation stipulates that emergency lighting must undergo a full test once a year, and be ‘flick-tested’ at least once a month. The main purpose of this kind of lighting is to illuminate escape routes, although it also allows occupants to find fire-fighting equipment if there’s a fire. Emergency lighting is usually powered by rechargeable batteries that self-charge from the mains power or other power source. The lights, known as ‘luminaries’, are either on constantly (‘maintained’) or are triggered by an interruption in the main power supply (‘non-maintained’). An emergency lighting test checks that your emergency lighting system and luminaries are in full working order up to the stipulated British Standard by simulating a mains power cut. The minimum permitted duration of an emergency escape lighting system is 1 hour and so your annual emergency lighting test will check that all of your lights turn on and stay on for at least 60 minutes and for as long as 3 hours, depending on the type of batteries you are using. 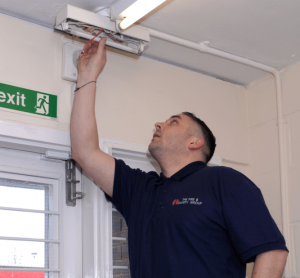 Our industry-approved emergency lighting engineers can carry out both 1 hour and 3 hour tests and carry most types of battery, lighting tube and light fittings on their vans so that they can quickly fix any issues during your emergency lighting test without needing a return visit. They will also record all findings in your log book and leave you on site with the relevant legal documentation. 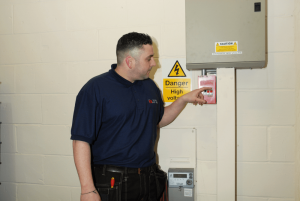 If you are responsible for commercial premises which have emergency lighting installed, then you will need to make sure that either you, a designated ‘competent person’, or a fire safety company undertake the regular emergency lighting tests as required by law. The purpose of the monthly test is to briefly check that all luminaries are in place, working and clean. This test can be carried out by you or a member of your team, as long as they follow the correct procedures. If your emergency lights work individually, each with its own switch, then you will only need to walk around the circuit once as you will be able to test both that the light works and that the battery is charging in one go. Because an emergency lighting test requires switching off the main lights circuit (to simulate a power cut), it can be disruptive for some businesses so you may want to consider carrying out this test out of hours, perhaps at dusk so that it is easy to see if the emergency lights are illuminated. We recommend that your annual test is carried out by a fire safety professional, otherwise you risk being in breach of UK fire safety regulations which can bring tough penalties. Your annual emergency lighting test takes the same form as the monthly test, with the difference that it should last for either 1 hour or 3 hours, depending on the type of batteries you have in your emergency lighting system. It’s called a ‘full discharge’ test and it tests that your batteries last as long as they should and meet the minimum legal requirement. Any failed batteries or lighting tubes should be replaced as quickly as possible following the test, and any more serious faults should be immediately investigated. If your emergency lighting needs testing, then get in touch with our friendly team today for prices and to book an appointment.